Conquer Space is a Real Time Strategy action game. 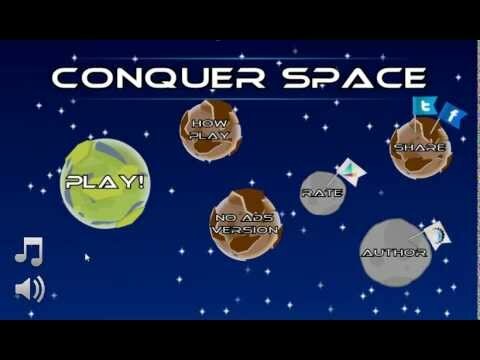 In Conquer Space, you have to annihilate the other planets. You are the green planet, your opponent is brown. Defend your world and destroy your opponent. Sometimes your enemies are more powerful than you, but they can't compete with your clever tactics! In the game you earn money that you can spend on upgrades: more of the units on the planet, faster production, increase the speed ships and increase the power units. In campaign mode You have to defeat 20 levels. If you like more and more fun, generator level, which is the game allows you to play an infinite number of levels! An interactive tutorial introduces intuitive controls, while levels gradually increase in difficulty! Send your ship into battle and fight for dominance! This game is similar to Phage Wars and Nano Wars. Good app, except the upgrades are actually useless. You never produce faster than the NPC, the other upgrades seem to do nothing, and the NPC needs to stop suddenly having two planets to start and just attacking your one planet before you can even do anything.